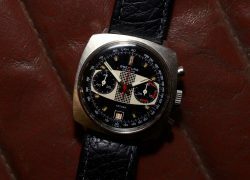 Racing Dial Breitling – Rare & Instantly Recognisable ! Back in the 1960s, Breitling were looking for exciting ways of extending and promoting their already trend-setting Top-Time range. One rarity they came up with, was their Racing Dial, featuring a unique central dashboard design and chequered flag logo. 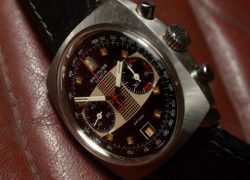 Marketed towards the rally and motor racing fraternity, their advertising material showed their Racing Dial watch alongside images of rally driving, speedway, and motor racing. Today, Breitling’s Racing Dial watch, is both rare to market, and instantly recognisable. And obviously it is supremely wearable by those with classic cars and classic bikes. 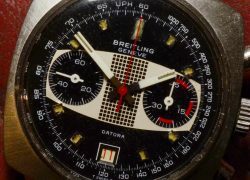 Item description: This rare example of Breitling’s ref 2030 ‘Racing Dial’ Datora Top-Time, dates from the late 1960s. and uses the highly regarded Valjoux 7734 chronograph movement. With a substantial stainless steel cushion case, and with circular chronograph pushers, this is a good looking watch. It has the typical Breitling Racing Dial, and since this is the up-market Datora version, it also has a calendar, which is situated a the 6.00 position. There was also a basic Racing Dial Top-Time, without calendar function. 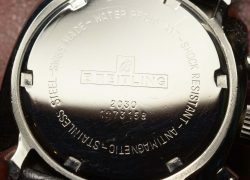 The reverse has a screw case-back with the Breitling name, reference number 2030, and the serial number. The watch complete with a new black leather strap and non-branded stainless steel buckle. Condition report: Excellent overall condition. Case in excellent condition, with the original sunburst finish remaining. 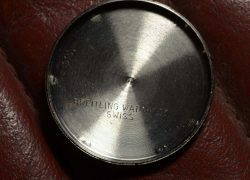 Reverse with polished case-back. Beautiful original dial with light ageing to the luminous hour battons. Breitling crown present. Movement functioning and fully serviced three years ago. Sweep seconds fly-back to 12.00 position correctly. 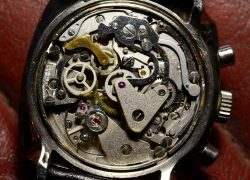 The timepiece may have been opened, so it should not be used near moisture or water without being checked by a qualified watchmaker. This was needed because of the lack of day and night during space travel. 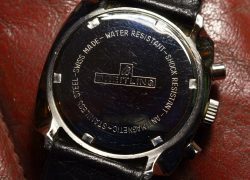 Breitling agreed to produce a 24 hour dial, which became known as the 24-hour Navitimer. Carpenter wore one of these on his 1962 space flight. Breitling later went on to produce the 24-hour version as the so-called Cosmonaut Navitimer. During the 1970s, and as the quartz revolution was hitting many tradition mechanical lead watch producers, Breitling were totally unprepared. 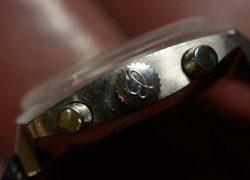 This led to the company being sold off in 1978 to Ernst Schneider, the owner of the Sicura brand of watches. 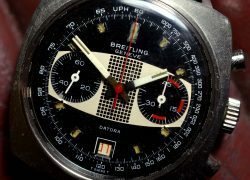 Schneider decided that there was more long term potential in the Breitling name, as opposed to his Sicura name, and as such dissolved the Sicura name to the benefit of Breitling. Special notes: Today, the Racing Dial Datora remains the rarest and most sought after of Breitling’s whole Top-Time range.